As a dark age looms for America, one of the important losses we expect to sustain is a robust climate change policy. Climate change deniers will now control the White House and both houses of Congress and probably the major climate-related agencies. 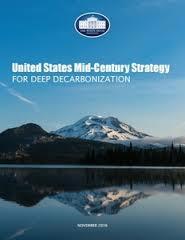 In the twilight of the Obama years the Administration has launched a “United States Mid-Century Strategy for Deep Decarbonization” (available here). Various comments on the document have ranged from “breathtaking” to a “good first step.” The Washington Post (here) notes that the strategy represents where the Obama Administration was headed. My own reaction is that the vision is bold enough, but the actual strategies to get there are not. On the transportation side, the document lays out the usual list: increase fuel efficiency, develop low-carbon fuels and vehicles, and reduce vehicle miles traveled. No question this is the right list, but how do we do that? For vehicles, the document states: “To achieve widespread penetration in upcoming decades, clean vehicles and fuels will require cost reductions, performance improvements, improved consumer acceptance, and development of infrastructure for recharging or fueling.” No doubt. What are the policies that will make that happen? For reducing VMT, it states: “State transportation departments and metropolitan planning organizations are taking the first steps to include GHG targets and performance measures as they develop their long-term transportation plans and transportation improvement programs.” If the first steps are being taken, what are the next steps? What is the role of the federal government in encouraging VMT reduction through better land use and transportation planning? · Establish preferential funding ratios for highway projects that are advanced under “blueprint planning” (linked transportation and land use planning). I only wish this was a dialogue we could have!